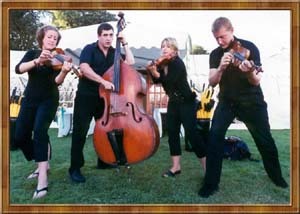 The highly successful Graffiti Classics string quartet was formed in 1997 by four young artists who met whilst busking in Covent Garden Market, London. 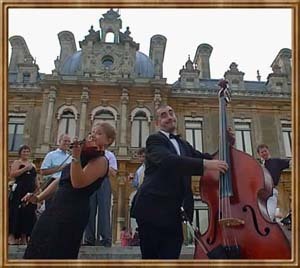 The group’s unique character and style has developed a refreshing insight into the world of classical music, the principle aims being to entertain, educate and bring an interactive involvement and understanding to audiences of all ages and abilities. They were accepted on to the Yehudi Menuhin’s ‘Live Music Now’ scheme in 1998, which has enabled them to tour extensively throughout England and Wales. In July 1999 they gave their prom debut at St. David’s Hall, Cardiff for the Welsh Proms, and in 2000 they performed at the launch of Bryn Terfel’s Faenol Festival. During this time they also appeared at the St. David’s, Wrexham and Criccieth Festivals in Wales, the Raw Talent Festival, Leicester and earlier this summer performed at the Middleham and Northern Aldborough Festivals, Yorkshire. As well as their ‘Cabaret – style’ performances, Graffiti Classics are known extensively throughout County Dublin for their educational workshops, having performed to over seventy five thousand children in the last four years. They have also performed at several sell-out concerts at ‘The Ark’, Dublin and have audiences reaching as far a field as Galway, where they regularly appear as part of the Baboro Festival. Since their debut on ‘The Late Late Show’ with Gay Byrne in 1998, the group have been in demand on Irish T.V. and radio, featuring on The Saturday Show, Live at Three, PM Live, Open House and Den 2.